Scaly Face is most often seen in Parakeets (Budgerigars) but can be found in finches as well. There are three types of mite that cause Scaly Face. 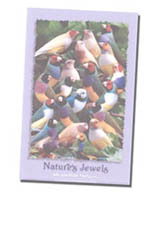 Each one targets a different type of bird species. To continue with the contiguity of this article I am going to talk mainly about finches but, this article can relate to most all bird species. In severe cases the finch (or bird) may be permanently disfigured. The visual signs of a scaly face usually start around the nares or the corner of the beak on either side. The crusty or filmy lesions then move to the eyes and can cover the eyelids. The infestation can also occur on the legs. 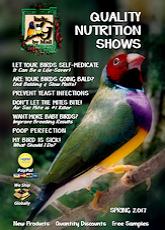 Without treatment your finch will eventually die. 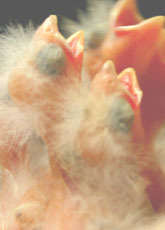 This condition is also called Tassle Foot in Canaries and other passerines. This mite is not highly contagious but is the result of immune suppression most often related to a nutritional imbalance or genetic predisposition. The treatment involves cutting excess tassles with a clipper as well as applying medication to areas involved using a cotton Q-tip plus S76 in the drinking water. Initial treatment is S76 painted on daily for 7 days and in the drinking water for 2 days. Apply undiluted S76 directly to the affected skin using a Q-tip each day for one week and S76 in drinking water for 2 days. Repeat S76 drinking water treatment and one application topically each week until all signs of mite have disappeared (recovery varies from 2-8 weeks depending upon the severity of infection.) Usual cure time is 3-4 weeks with mild infestations. Keep away from eyes & nostrils. Apply a drop of SCATT for 30 grams of body weight to the upper part of the thigh one time and then again 3 weeks later. After applying the drop, place several drops onto a Q-tip and gently wipe it across the affected area. Take care when working on the beak not to get any liquid into the bird's eyes & nostrils. Each week thereafter apply the SCATT liquid only to the affected area using the Q-tip method. Disinfect cage weekly using KD or Pet Focus. In addition use nutritional supplements such as Herb Salad™, Heardy Bird or Turbobooster, Epowder and Fvite on food daily during the 6 week treatment and DufoPlus and Ioford for 2 days a week to help accelerate recovery. Follow up with S76, Iverlux or Scatt one day each month during summer months and once every 3rd month at other times of the year. If possible give plenty of sunshine. A little history for those who may be interested: Scaly Face has been a problem ever since people started keeping birds as pets. For a very long time everyone thought Scaly Face was caused by a mold or fungus infection. Many topical ointments and solutions were tried but little worked. It wasn't until 1951 that the mite was discovered to be the actual cause. 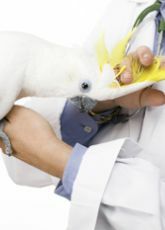 From then on avian fanciers and veterinarians alike have been working to find the best way to kill the mites.